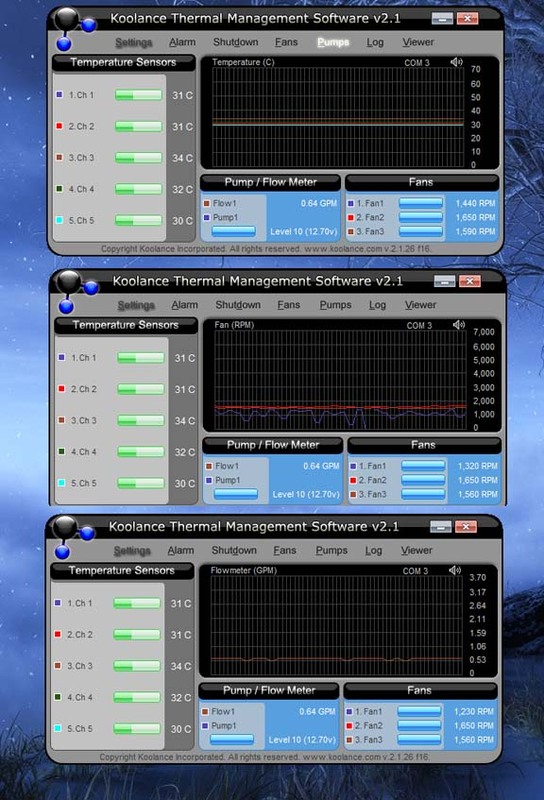 The long-awaited Koolance TMS-200 thermal management system provides convenient software control over features found in many Koolance systems: temperature feedback, pump speeds, and fan speeds. In addition to these basic functions, however, are a wealth of extra capabilities! TMS-200 supports 32-bit and 64-bit versions of Microsoft Windows XP, Windows Vista, and Windows 7. Hardware is included for mounting the TMS interface card into an empty motherboard slot or 5.25" drive bay. All communication occurs via an external or internal USB port, even when installed into a motherboard slot. The TMS hardware board is powered by a direct 12V Molex power supply connection. Fan/Pump connector maximum = 2A/ea. Total board limit = 6.5A. COMPATIBILITY NOTES: TMS can not adjust pump or fan speeds for Koolance "Exos" and "ERM" units without some customer DIY wiring extensions, and is not generally intended to be used with these external products. (Internal chassis or secondary radiator fans could be controlled instead.) Coolant flow reporting requires an optional Koolance INS-FM16 or INS-FM17 flow meter. Pump power adjustment requires a Koolance 12V DC pump-based system, such as: RP-1000, PC4, PC5, TNK-400, RP-980, PMP-300, PMP-400, PMP-450/S (requires power adapter), etc. Pump speed RPM reporting requires 3-wire (tach) pumps. Fan speed RPM reporting requires 3-wire (tach) fans. Includes TMS interface board, metal L-bracket, aluminum 5.25" drive bay tray, 5 x temperature sensors, ATX shutdown lead, external USB cable, internal USB cable, Molex power extension, 3 x 3-pin fan wire extensions, and one 3-pin pump wire extension.